A thirteenth century castle and citadel, Castle Del Monte, has been declared a World Heritage site by UNESCO. Standing tall at 26 meter, the Castle is said to be built in 1240-1250 under the orders of the Roman Emperor Frederick II. The original structure had marble columns and walls. But once the building went into disrepair, the structure was vandalized and stripped off and all the marble was re-used in constructions nearby. Octagonal shaped courtyard: contrast of colours created using stones, marble and limestone. Two floors with 8 huge halls on each floor. Ingenious method of tiling. Check out the interesting acoustics layout within the castle. Beautiful use of coral stones across the castle. Symbolic representations and significance: mathematical and astronomical layout, medieval depictions, influences of the Islamic Orient and classical times. Research the net in advance for all relevant timetables. A fading history remains of the earlier decorations of mosaic and carvings. Last admission is allowed half an hour before the closing time. Admission free for above 65 years and below 18 years. 50% discount for visitors between 18-25 years. Andria can be reached from Bari or Trani by both train and bus. Bus#6 at Andria for Castle del Monte. Check attraction website for bus timetables. 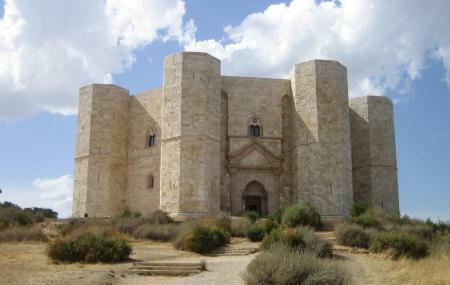 How popular is Castel Del Monte? People normally club together Trani and Cathedral's Bell Tower while planning their visit to Castel Del Monte.